The demands of making pottery mean that I haven’t been able to write this blog since my note on Sicilian maiolica.With orders from galleries and exhibitions coming in the autumn I’ve been in the studio all day. It’s a dirty job, but someone has to do it. Cleaner and prettier than this heap of clay (above) fresh from the pugmill have been my experiments with a new glaze. My existing glaze is a fairly standard maiolica, based on lead and tin oxides, derived from recipes by Daphne Carnegy and Alan Caiger-Smith. Such a glaze gives opacity, moderate hardness, sheen and a good colour response. Its only disadvantage is a slight yellow cast. So I’ve been formulating a high alkaline glaze in order to get turquoise blue, which you can’t get with a lead glaze. 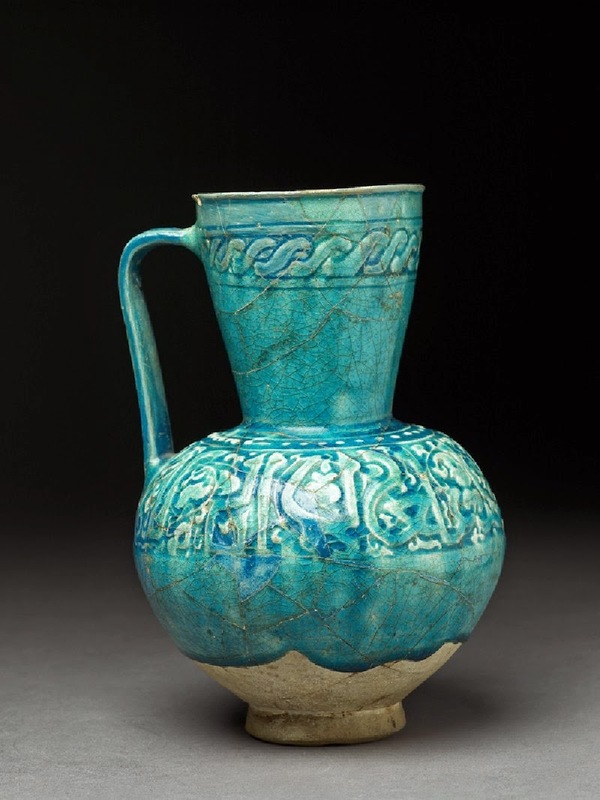 Turquoise alkaline glazes were the glory of medieval Persian pottery, like this beautiful jug (left) in the Ashmolean Museum, Oxford. Finally, after many trials (below), I found a good glaze. The trials involved changing the way I fire my bisque. 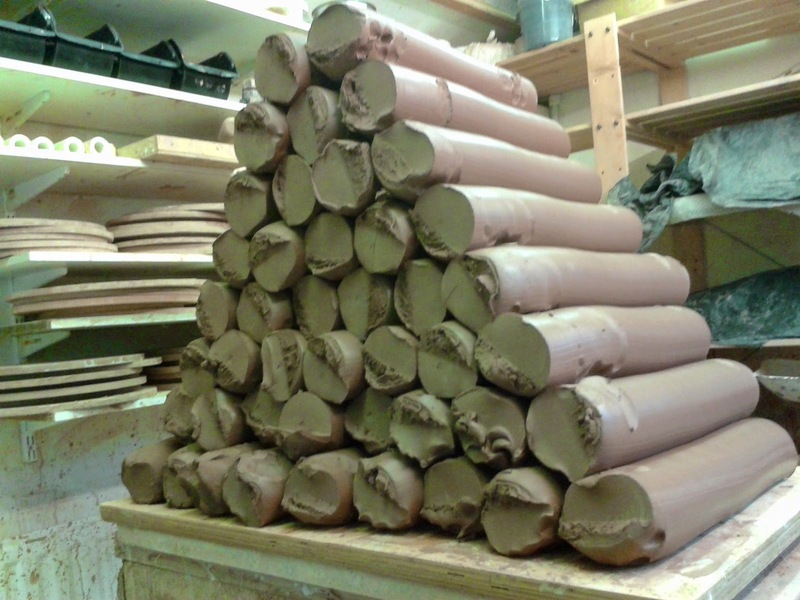 Previously I followed the usual studio pottery practice, firing bisque to about 1000˚C and glaze to about 1060˚C. 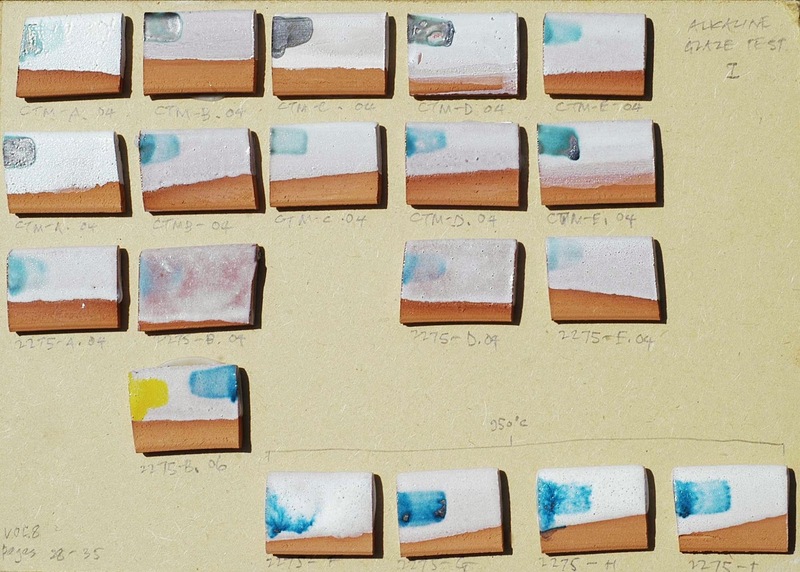 The alkaline glaze only works with bisque at 1085˚C and glaze at 995˚C. It’s cheaper than a lead glaze and uses about 10% less energy, so it’s good for the environment too. Reports and pictures soon. Very interesting art work in progress and very beautiful pottery !! !